Dr. Anthony Domenico completed his undergraduate education at Holy Cross College in Notre Dame, IN. He earned his Doctorate of Dental Surgery at Loyola Dental School and completed his general practice residency at St. Clare’s Hospital. Dr. Domenico’s endodontic training was done at the University at Buffalo Dental School. Since completing his formal education more than 35 years ago, Dr. Domenico has a unique perspective of what was, what is, and what will be, particularly in endodontics. He has continued his education in the revolutionary advancements in 3D dentistry and endodontics. He enjoys learning about all the new, modern technology in the hopes that it will help him better serve his patients. Dr. Domenico’s passion rests in delivering high quality care to his patients. He finds joy in making a difference in the lives of people each and every day by relieving their pain and restoring their health and happiness. 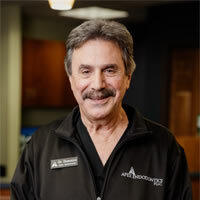 Dr. Domenico grew up in Albany as one of six children and has lived in Amherst for 37 years. He is currently engaged to a lovely lady. Dr. Domenico enjoys exercise, travel, current events, and teaching his parrot to speak. Shawn F. Jordan, DDS, MS Anthony Dominico, DDS 605 Division St.